Strawberry flavoured fruit sticks made from dried fruit, strawberry fruit purée and natural flavouring. †Each 13g stick is the equivalent to 67g of fresh fruit. A kids portion of fresh fruit and veg is 50g. 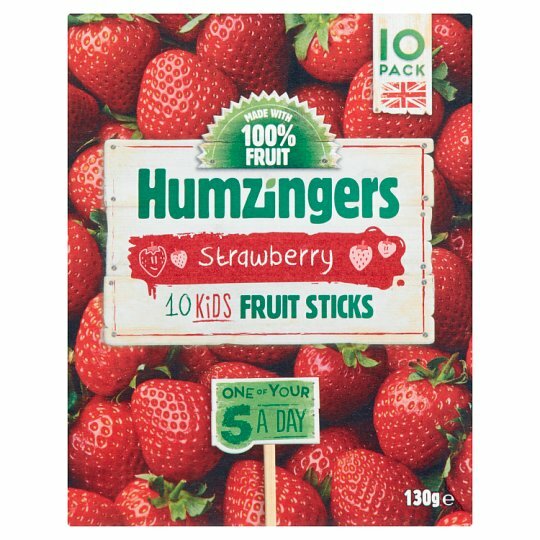 Packed with 100% fruit goodness and No Added Sugar, Humzingers are perfect for a healthy snack or as a treat in kids lunch boxes. Store in a cool, dry place. Once opened, consume each individual stick., For best before end see base of pack. To reduce stickiness, bars are slightly dusted with white starch. Caution Not recommended for unsupervised young children due to occasional small fruit pips or stones.